Over the past few years now, Sunday Brunch is a synonymous Weekend must in my wicked calendar. I would love to rename every day of the week to Brunch day, but then, life would be too monotonous, right? 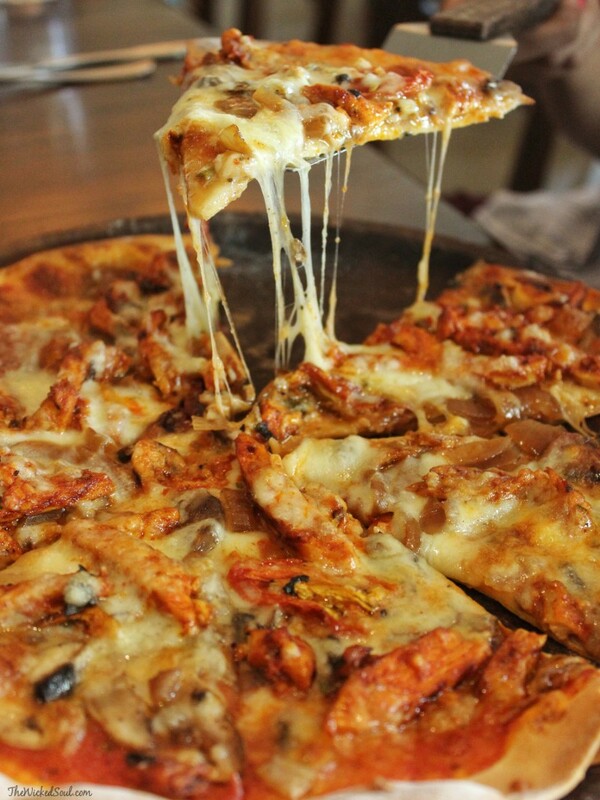 There is no dearth of scrumptious heart pleasing food in Mumbai. 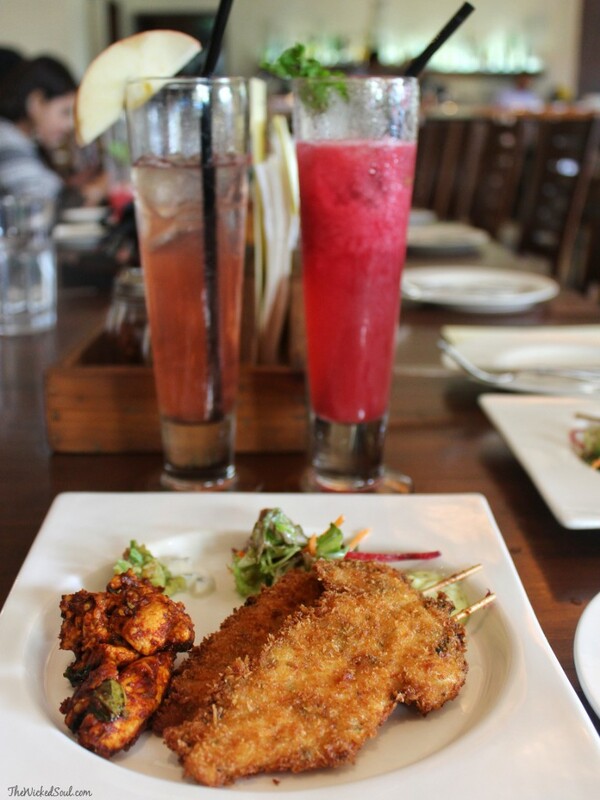 The choices are aplenty; from Indian to Continental to Multi-national cuisine. However, starting a Sunday with a tasty brunch is not as simple as it sounds. 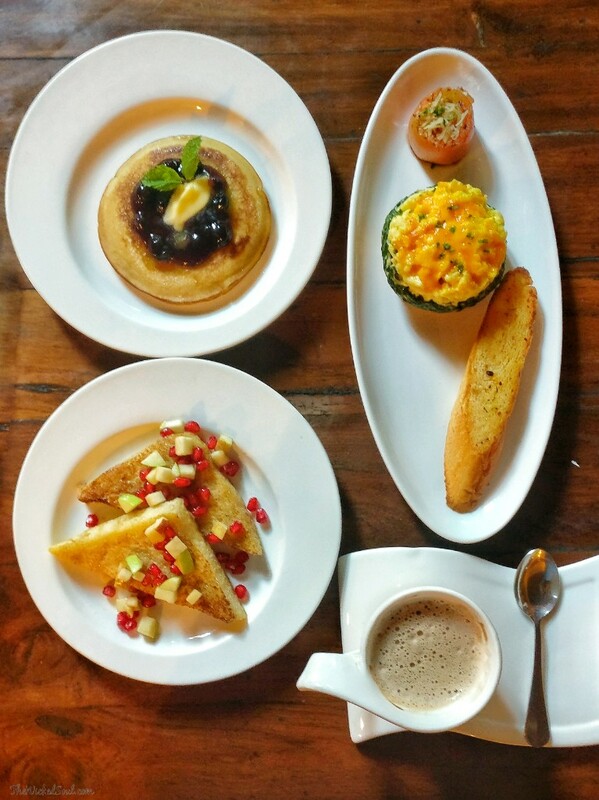 This past weekend, I was scouting the food network for a delightful brunch and Café Mangii, Bandra popped up brightly. The café has 2 unique distinct outlets; Bandra & Powai. The Bandra joint has a rather cozy ambiance making it perfect for a quiet dinner while the Powai outlet is airier with sharp light flooding in, an apt place for a day affair. Mangii Egg Decker: Cheesy Scrambled egg spread on a bed of potato rosti and creamy spinach and served with a side of garlic toasties. The creamy, fluffy scrambled egg and crunchy rosti is an eggcellent way to start your day. Blueberry Pancakes came with a dollop of blueberry compote. They were soft and fluffy and were gobbled up in minutes. French Toast: Two slices of toast topped with seasonal fruits. It was a particularly dry affair and lacked the moist and tenderness expected in a classic French toast. The Coffee was an average brew and nothing to write home about. After the breakfast special, we dug into Small bites and the Italian fare on offer. Cajun Chicken served with Garlic aioli & sour cream was a perfect composition of salty, spicy and savory flavors. Crumbed Fried Herb Chicken: Succulent herb chicken coated with a crackling crumb of egg and breadcrumbs. This is a great option for small bites while reserving an elephant sized room for desserts. November Breeze was a refreshing concoction of apple and cranberry juice. The sweetness of strawberries and the mildly spicy guava make the Strawberry and Guava Cooler a mood pleaser. 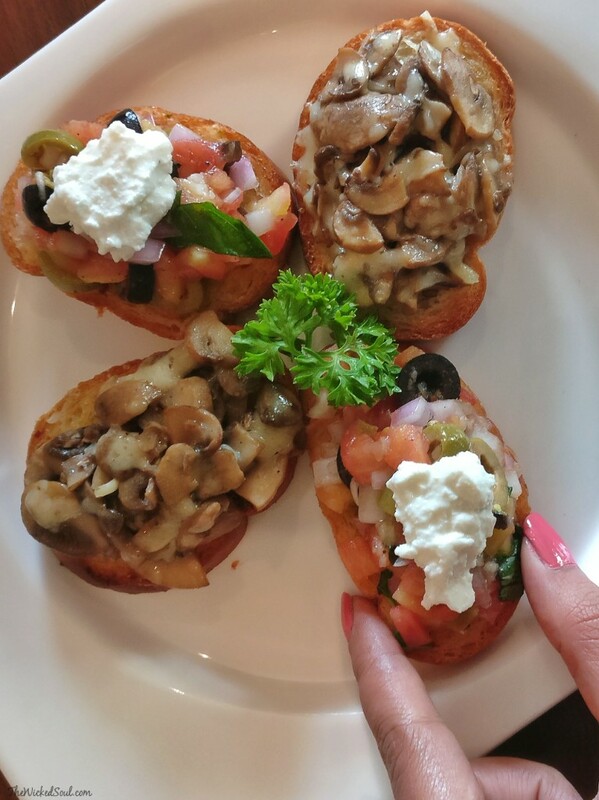 Even though I dig non-veg starters, Mushrooms never fail to captivate me. Olive and Tomato Salsa with goat cheese Bruschetta was just as impressive. While the appetizers were seamless, Cajun Creole Chicken Pizza was a disappointment. Thin crust pizza laden with Cajun chicken, button mushrooms, balsamic onions and sundried tomatoes and cheese was unappetizing, to say the least. It lacked even the most basic seasoning which would add some flavor to this bland choice. Penne Pasta: This Classic Alfredo pasta was cooked perfectly in rich and creamy parmesan sauce hitting the right spots. 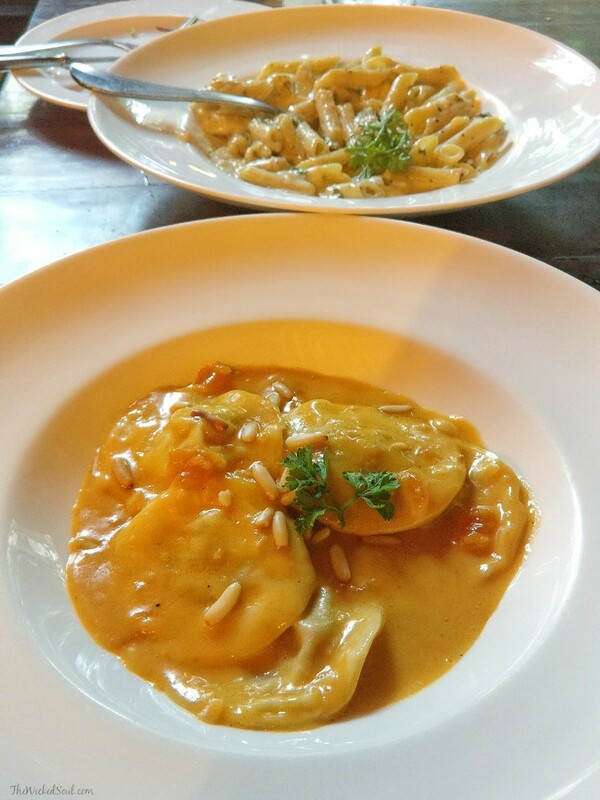 Ravioli with Orange sauce Paprika: Leek and Parmesan stuffed ravioli in Orange and butter paprika sauce and topped with pine nuts. The sauce was deliciously creamy, however, the Ravioli felt dry and chewy rather than delicate cushy flavorful parcels. All these delicious offerings, but nothing as pleasing as a dessert. 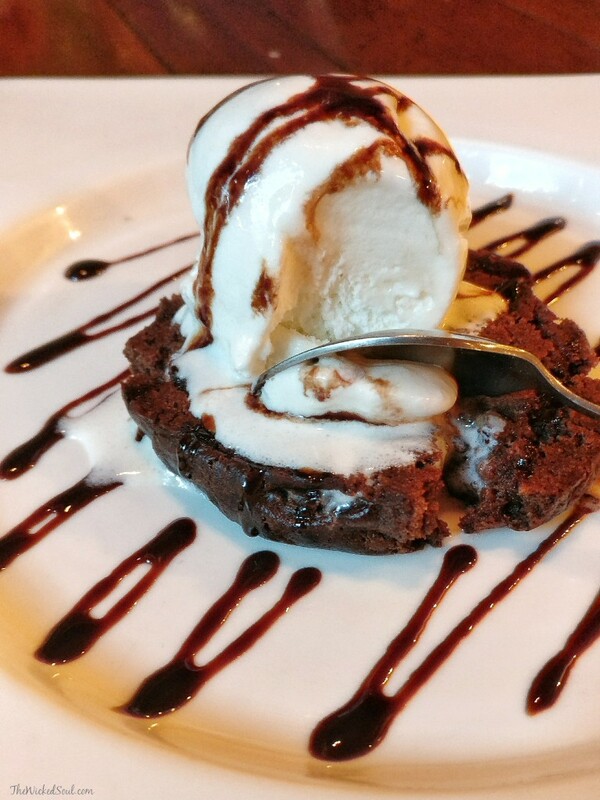 As on numerous occasions before, desserts have always lifted the entire meal course single-handedly. Over 8 different types of delectable desserts, but the Philadelphia Cheese Cake and Molleoux were my absolute favorites part of Sunday brunch. #Dessertgasm take a note, people. Café Mangii strolls comfortably into my list of favorite Sunday Brunch Spots. Have you been there yet? Which is your favorite brunch place? Write back to me.